Select the date you want to book and choose from our options of availability to complete the booking. One thing’s for sure… you’ve never seen NYC like this before! 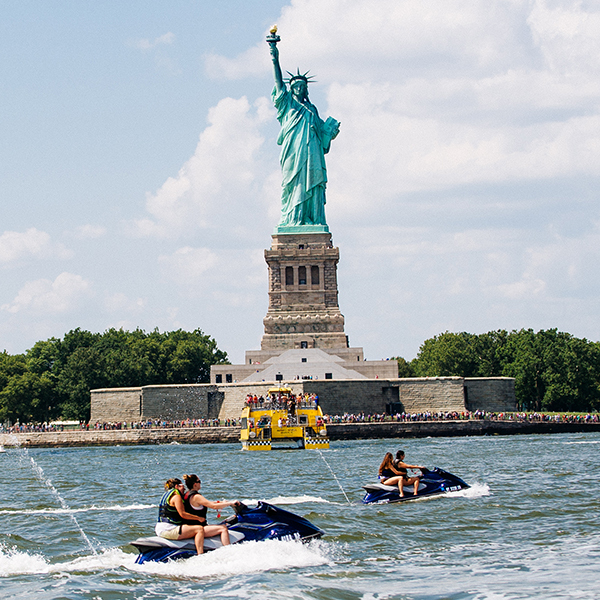 Take in the Big Apple by water on this exhilarating Jet Ski tour around NYC where we leave no stone unturned. 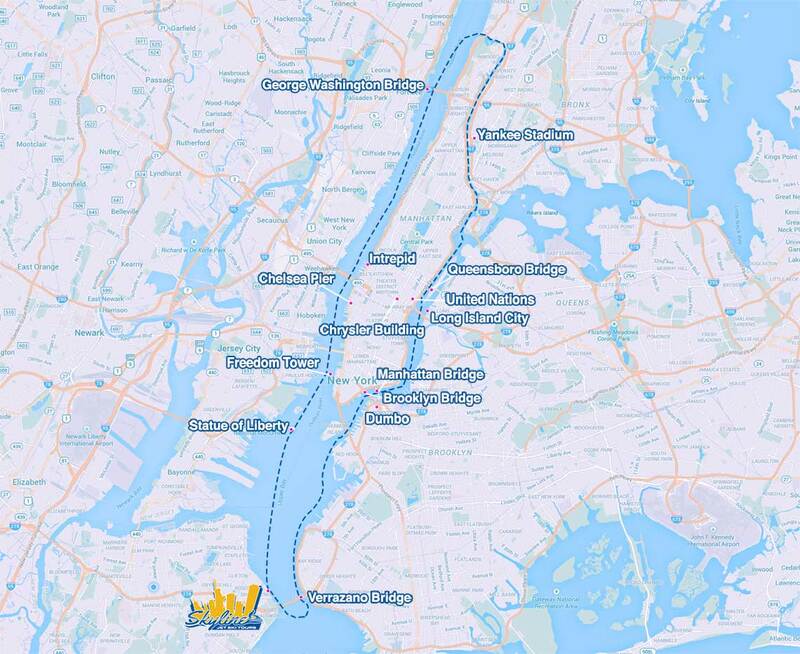 Starting from lower Manhattan and traveling up the Hudson River, passing under world renowned bridges and down the East River towards the Verrazano, you will see it all in a once-in-a-lifetime adventure around Manhattan! Call Us For Group Rates! Our Policy: Each participant must have a valid photo ID with them at check-in. All passengers must be 16 years or older, all drivers 18 years or older. 1 credit/debit card, or $250 cash must be left as a security deposit incase of damage PER JET SKI, so 7 jet skis 7 security deposits, 1 card cannot be left for all machines. All participants MUST arrive 30 minutes prior to their booking time or risk losing their reservation. There is NO rescheduling less than 24 hours from the scheduled departure time. There are no cancellations after purchase, only rescheduling for the same season. If there is an electrical storm in the area, or there is going to be a storm during the time of the rental or tour, the tour will be called off by the crew 3 hours or less prior to the scheduled time, and all customers can reschedule their ride for either the nearest opening or another day. If it is raining we will likely continue on as normal and give participants wetsuits, goggles or face masks to assure comfort in rain. There are no cellphones permitted on tours or rentals due to the distraction it creates for participants along with the damage storing a phone in a jet ski’s compartment. Photo, video and drone footage packages can be added at check-in. Please bring a lock if you plan on keeping something in one of our complimentary lockers, it is not safe or smart to take valuables or wear expensive jewelry on your ride. Complimentary parking along with restrooms and showers are available on our premises. The best location to put into a GPS is 417 Bay 41st Street, Brooklyn NY 11214, upon entering through the marina gate you find the first available parking spot and walk down the ramp across from the marina entrance. Follow the jet ski signs down to the left and you’ll see our blue and white sign. If the marina gate is closed please call 917-708-3813 and our guard will open the gate for you. 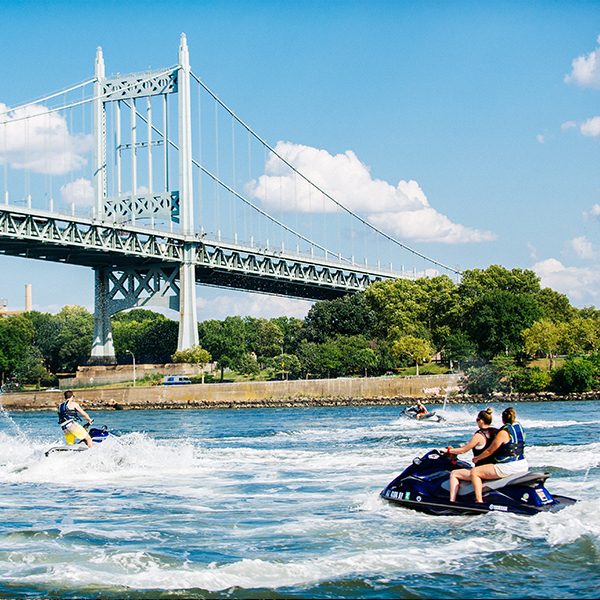 My friends and I rented 3 jet skis for a tour around Manhattan. Jerry was awesome and runs a great business. Jet skis were well maintained and went 50mph at WOT. Wetsuits were provided. I would highly recommend Skyline Jetski and I’ll be back next season!